The hilly hamlets of Darjeeling hill station is a home to many monasteries and revered gompas. 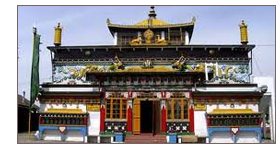 Popular amongst them is Ghoom Monastery or Yiga Choling Gompa which is synonymous to the serene peace resting in the hilly retreat. The attractions in Ghoom include the statue of seated Maitreya, future Buddha, wonderful old murals and rare preserve of Buddhist manuscripts. Japanese Peace Pagoda in Darjeeling is one of the 70 pagodas built by the Japanese Buddhist Nipponzan Myohoji organization around the world. Jagjivanpur in Malda District unearthed the excavations of Buddhist Monastery called Nandadirghika-Udranga Mahavihara. Burdwans excavations in 1972 to 1974 revealed a Buddhist monastic complex at Bharatpur.